The National College Access Network has recently released a white paper assessing data platforms used by college access and success programs nationwide. Data Usage and Platforms for College Access and Success: Insight from the Field reviews the usage of these various platforms. Written as a product of the Common Measures Learning Community, this paper includes data from a survey of NCAN members and testimonials of five different data platforms used by college access and success programs nationally. You can access the NCAN whitepaper here. Respondent feedback regarding Naviance was overwhelmingly positive. The NCAN paper outlines the advantages for Naviance use with college access programs through its ability to report at various levels, its usability amongst various populations, and the user-friendly design of the system. Testimonials from Naviance clients and NCAN members College Possible, College Bound-St. Louis, Collegiate Directions, Inc., and AchieveMPLS paint the picture of the Naviance/College Access fit. 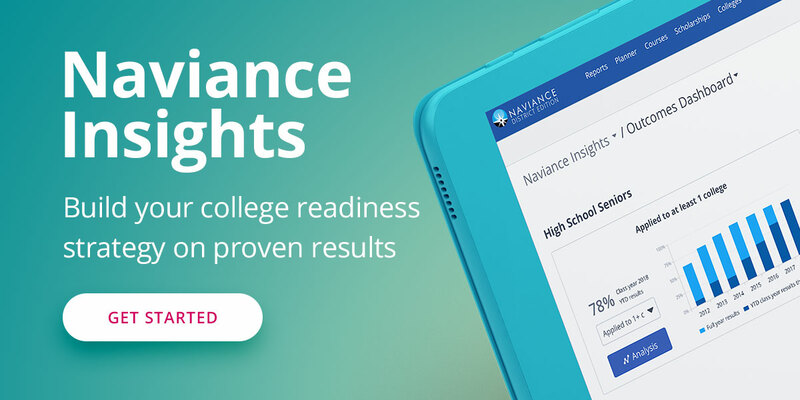 If you are interested to find out more about how Naviance can work for your College Access Program, visit us at www.naviance.com.